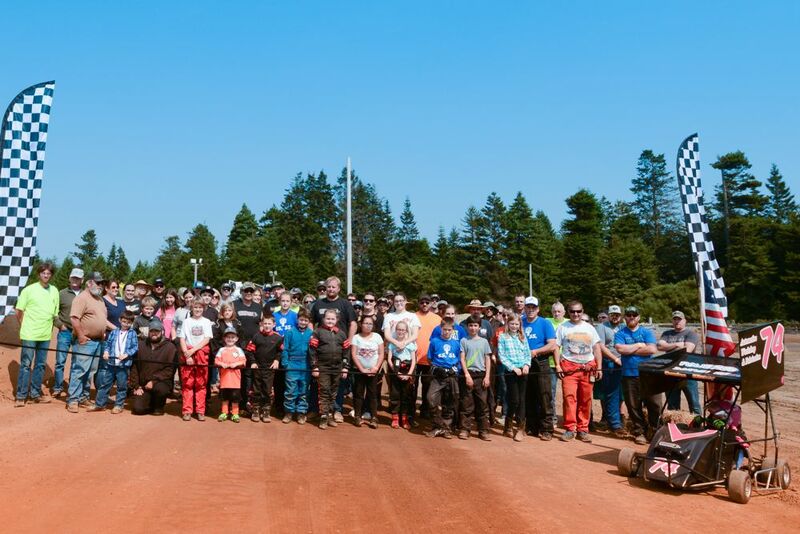 Eureka, CA (August 26, 2018) – The highly anticipated debut of the new 1/8-mile dirt venue took place this past Saturday at the Redwood Acres Fairgrounds. It was an exciting afternoon for all involved as a ribbon cutting ceremony prior to the action on the track took place at the start/finish line. The new track’s location on the fairground’s property took the place of the previous rodeo arena giving Redwood Acres and outlaw kart racers their own permanent bullring track. 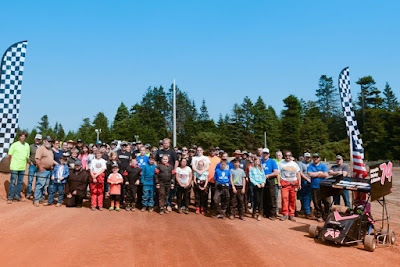 The Mill Yard sponsored the racing action which not only celebrated a new beginning of racing in Northern California but also the hard work and dedication of many volunteers who helped made the track become a reality. Chayce Smith took the victory in the Champagne Attorney Service beginner box stock division. The feature event got off to a slow start with two multiple-kart incidents on the initial two restarts. The third restart saw Smith jump to the race lead and he never looked back. At the finish it was Smith taking the win over Jack Myer, Danica Kinsey and Aaliyah Mitchell. The Williamson Financial Group box stocks had a nice turnout of karts which necessitated two heat races. Grant Williamson won the first heat while Timmy Walters took the second. Dylan Combest had issues in his heat which prevented him from finishing but that did nothing to slow him at the start of the main event as he led early over Brady Osborne. Derrick Kessler, Jr. was able to maneuver to the lead just as a spin by Sonya Osborne slowed the field. Combest got a great restart and took the lead back from Kessler, Jr. Austin Bartholomew was beginning to make his way to the front as he entered third place in the middle stages of the race but a spin off turn two ended his chance at victory. Combest led the restart and was able to pull away from the pack while second on the back shuffled from lap to lap. At the finish it was Combest winning over Janice Walters. Brady Osborne was third with Mitchell Matteoli fourth and Williamson fifth. The new raceway looked to be a better fit for the faster Wes Green Landscaping 125/250cc karts. Landen Green has been the dominant driver in the division and he was able to easily transition from the 1/8-track the karts previous raced on to the new track with a win in the heat race. Wyatt Burns briefly led the main event but a spin off turn two gave Green the lead. Nobody had anything for Green who was able to pull away from the pack of Maleesa Miles, MKinzy Uselton and Burns who traded second position several times. Green was able to bring it home first at the finish over Burns and Uselton while Miles was fourth but unable to finish the race due to mechanical issues. Like the 125/250cc karts, the NorCal Automotive 500cc/open karts seemed to take to the new track very well. Tony Miles held on to take the heat race victory. The feature proved to be a battle of survival as every driver in the event seemed to have one mechanical issue or another. Miles looked to have the victory sewn up in the late stages when Dax Williamson was forced into the pits. Williamson was able to return and took the lead when Miles had issues with his kart. Miles returned and the two settled the race for the victory on the track. Miles jumped into the lead on the final restart and was able to beat Williamson to the finish. Gary Foster was third with Jordan Miclette fourth. Nick Ford took the heat race victory in the Fortuna Wheel & Brake old fart karts. Chelsea Champagne jumped to the lead in the feature and was able to pull out to a substantial lead. Ford was likely her primary competition but he got hooked up with the hay bales off turn two which cost him almost a full lap to the leader Champagne. Ford ran as hard as he could as he was able to get by Sabrina Kinsey and Amanda Harp but without the aid of a caution he was unable to make up ground on the leader. Champagne cruised to the win over Ford, Harp and Kinsey. Two competitors from Redwood Acres Raceway’s Legends division raced in the Miclette Family Racing pure stocks with point leader Chris Lawrence and Leonard Ward racing for the afternoon. Ward was able to take the heat race victory. Unfortunately, one of the competitors Ryan Ahrens had issues in the heat and was unable to start the feature race. Ward took the lead at the start of the main event and looked to have the race well in hand. A spin in turn four took Ward out of the lead and putting Lawrence up front. That was all Lawrence needed as he was able to lead from the restart to the checkered flag for the victory. Pete Miclette took second with Ward placing third. 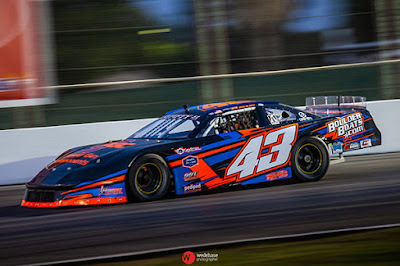 MADERA, CALIFORNIA (August 25, 2018) – Bakersfield drivers continued their stranglehold on the RPM Mortgage Pro Late Models with Racin Vernon earning his second victory of 2018 while Las Vegas’ Tanner Reif won his first career 51FIFTY Energy Drink Jr. Late Model Series race on Saturday at Madera Speedway. 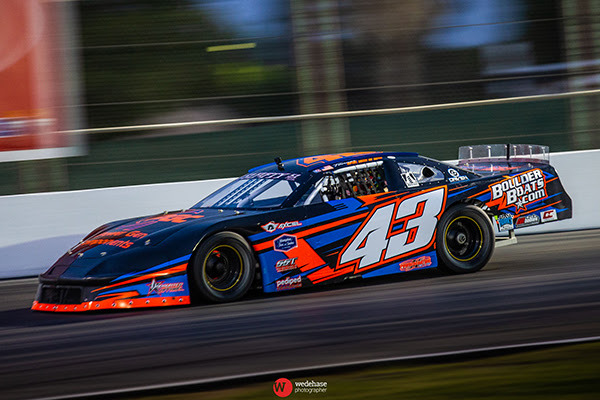 The MAVTV-televised action played out on the one-third mile asphalt oval at the Madera fairgrounds. For Vernon, the $2,000 win avenged a two year stretch full of ups and downs in the tough series. Incoming points leader Austin Herzog, 16, earned fast-time before drawing fourth in the redraw. Napa’s Logan Zampa won the pole and led the first four laps of the event. Vernon started third after qualifying fifth and nosed inside Zampa to take the lead on lap five. The first caution flew on lap nine when double-duty racer Kayla Eshleman spun in turn two. Ross Strmiska used the restart take over second from Zampa on lap 11. Herzog followed suit moving into third on lap 15, with both passes made on the outside. Herzog looked poised to dash to the front before a rear end failure brought his car to a halt at the top of turn two for a lap 15 caution. This played to the favor of 2016 champion Matt Erickson, who entered the night second in points but started a dismal 11th. Leading rookie Adam Lemke of Hollister rolled the bottom to grab third from Strmiska and brought his teammate 13 year-old Jesse Love with him. Love, with eight career Jr. Late Model wins, is the youngest starter in series history. Lemke then took over second from Zampa on lap 22. Lapped traffic tightened up the top-five cars on lap 33 before a caution when Jason Aguirre and JJ Ferguson bounced off the front stretch wall with heavy damage. The caution flew again on lap 35 when Nick Grossi slowed with apparent issues in the rear end as well. Lemke closed down on Vernon for the lead coming into the lap 50 break with Zampa third ahead of Strmiska and Love. Vernon slid sideways on the restart but maintained the lead making for a wild two-by-two battle behind him. Both Strmiska and Erickson attempted to swoop past Love on the outside while Lemke and Zampa continued to duel. The caution waved on lap 55 and Love took over third from Lemke on the restart. Dillon Tucker briefly looked outside Lemke for fourth as well. Tucker had driven from 13th to fifth before he too suffered mechanical issues that derailed his evening. Zampa and Love closed down on Vernon in lapped traffic on lap 61 before he managed to pull away again. Racin Vernon pulled away for the win with Zampa holding off a great battle with Love for second. Erickson unofficial took over the points lead by finishing fourth while Strmiska was fifth. Tanner Reif finished second to his brother Tyler in the closest finish in Jr. Late Model history on July 28th. He made up for that performance by getting his first career win on Saturday night in the 70 lap feature. 15 drivers ages 10-16 years old took the green flag with defending champion Jesse Love leading from the pole. Kabe McClenny had his night end prematurely when he slid up into Tyler Reif on a lap 10 restart in turn two. McClenny hit the wall and had to retire with damage. Sixth starting Dylan Zampa, the incoming points leader, was the driver on the move as he worked his way up in to third by lap ten. Austin Edwards slowed with mechanical issues on lap 15 and was out of the race as well. Tanner Reif set a new track record in qualifying and drove from fifth up to second to challenge Love. The duo ran nose-to-tail for many laps until a caution on lap 23. The restart allowed Dylan Zampa to snake into second but Reif took the position back on lap 34. Reif hounded Love all the way to lap 38 when Kayla Eshleman had an incident with Joey Iest in turn one. The scheduled lap 40 break occurred two laps early and Eshleman was removed from the race by race officials for her involvement. The intensity level never faltered in the second half of the race as Tyler Reif took over third. Tanner Reif stormed to the lead on lap 48 and his lead over Love see-sawed from one car length to third car lengths over the rest of the race distance. On lap 65, Zampa charged back past Tyler Reif for third but he was too far behind the top-two to capitalize. Tanner Reif earned his first career win by .840 seconds over Jesse Love with Dylan Zampa third followed by Tyler Reif and Joey Iest. MAVTV cameras were also rolling for the 14 car, 20 lap Mini Cups vs. Bandoleros. Bakersfield’s Kercie Jung took the lead on lap four and never looked back for the Bandolero win along with the overall win. The Mini Cup action was wild, punctuated by a lap one incident when the Bandolero of Ethan Nascimento spun in turn four. Both points leader Kale McClenny and Jayce McArthey were eliminated with damage while trying to avoid the spun out car. Their misfortune thrust Napa’s Aaron Thomas into the Mini Cup fold as he held off Madera’s Joseph Holiday for the trophy. The Bandoleros swept the overall top-five led by Jung ahead of Seth Wise, Hank Hall, Zachary Ginn, and Trenton Eurto. Legends of the Pacific presented 15 cars for a 35 lap feature and it was yet another redemption story. Sheldon Crouse had lost the August 11th race with a turn three spin on the final lap that involved Cody Winchel. The pair picked up where they left off, entertaining the fans with a battle that included four lead changes. Crouse finally made the decisive pass for the lead on lap 22. A caution on lap 26 brought the field back together but Crouse again drove away from Winchel. The top-five at the finish were Crouse, Winchel, Pete Soto, Chad Nascimento, and Braden Rogers. Toyota Sedans was dominated by Jason Lawton, taking over the lead for the final time on lap 17 en route to a commanding victory. Recent race winner Greg Tyler was second ahead of 2016 champ Jillaun Holden and rookies Kyle Labrie and John Tevis, Jr.
Madera Racing on MAVTV airs Thursdays re-runs of the 2017 season every week. The show airs at 5 p.m. and 8 p.m. PST and is also available on the Lucas Oil Racing TV app. The fourth round of the RPM Mortgage Pro Late Models airs August 30th.